Opening Sentences of You are a Gift to the World: I remember when you asked, “What’s the best gift in the whole wide world?” I looked at you and knew the answer was right inside my heart. Opening Sentences of The World is a Gift to You: I remember when you asked, “What’s the biggest gift in the whole wide world?” I took a deep breath and let this answer flow from my heart. 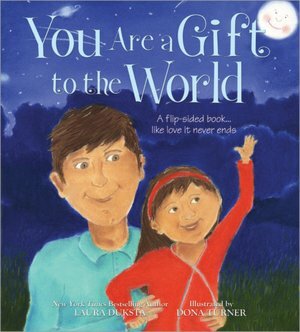 Synopsis: One side of the book features a father telling a little girl all the things he loves about her, all the things that make her an individual. The flip side of the book features the same father and little girl, with the discussion being about the wonders of the natural world. Both sides meet in the middle with a center double page spread that provides a beautiful and touching conclusion to either book and to both books. Activities/Resources: Although I couldn’t find any activities specific to this book, the themes of the book certainly lend themselves to activities. There is indication of an intention to have activities on the author’s website. Lesson plans that teach about the interconnectedness of people, and the interconnectedness of people and the natural world, can be found at Lesson Planet. The Little Earth Charter offers a concrete way for kids to get involved in learning about and promoting the concept of interconnectedness. Availability: Readily available in hardcover flip-book. LOVE this interconnected theme and how clever to have the connections woven together as two stories- in one. This world view is also great to impart to children that we each are a gift, but the world is also a gift to us that we need to care for. Lovely choice, Beth, of a book I hadn’t heard of. When I saw this book in the bookstore, I immediately knew it would be PERFECT for the week when I was spotlighting our Hub friendships. I really like books like this – Books that make you feel special, and this book also shows how the world is special! Very cool! Thanks, Erik — I really think you’ll love this book. I especially like that the two books meet at the center and the center page applies to both stories. I have to admit, I am a sucker for these books, which express a parent’s love for a child. I love the natural world element. We’ll read it! Great to hear you’ll read the book! Enjoy! I’m particularly touched that this is from a father’s point of view. I adore all the books with moms and their darlings or both mom and dad. But to put that special father/daughter bond into a PB is just too wonderful. Yes, that meant a lot to me, as well, that it was the father and daughter interacting. It’s lovely. Thanks, Angela! Wow, this looks fabulous! Will definitely look it up. This book sounds lovely – like every book you choose, Beth! – a wonderful combination of the individual and the community. How nice to share both the message that the little girl is special and the message that the earth is. I will definitely have to search this one out. Thanks so much for sharing! Thanks so much, Susanna! I know you’ll enjoy the book. The opening sentence melted my heart! Such an unplifting message. Sounds like a very unique book, especially since it is from the father’s perspective. Great selection. Wll have to check it out. Isn’t that first line lovely? When I saw the book, I knew I just had to share it this week. Enjoy! So clever! I love the innovation of the two-sided book and the interconnectedness of the stories. Am going to look for this one. I got a little sappy reading this one. I’m really interested in how the stories meet in the middle. It’s a lovely book, though it does tug at the heartstrings a bit! Beth this sounds so unique and right up my street. I’m definitely going to have to get this one. Thanks! Oh gosh! I teared up when I read that first line. Loved that it brought the world into how special we all are and i loved the two sided book idea, very clever. I obviously should have set out a box of tissues for everyone! The two-sided book is perfect for this concept. This is one I will need to find. I love the idea of the two stories melding in the center of the book! When I discovered the melding in the middle, I was totally delighted. It’s done so cleverly — I won’t give it away, but oh my, I like it! Beautiful book, Beth, with an equally beautiful message…one that never gets old. I love the parallel story that encourages care and preservation of the planet…it will, after all, be the children of today who will have to find solutions to the environmental problems we’ve created in the last 100 years. Thanks, Vivian. You are so right about who will have to bear the burden for what has happened to our planet. It’s always an adventure finding resources for the books! I love sweet, confidence and esteem building books for children. Thanks for sharing. Nice to “meet” you through PPBFs. Thanks, Laura. I think you’d enjoy this book. Nice to meet you, too! I love books/storylines where there are separate stories that intertwine somehow. I’m doing a column on picture books for a local parents club and next month’s theme is Earth Day. This sounds like it could be a good selection. Thanks for sharing! Sounds like a great idea, Margaret! Hope the book turns out to be what you’re looking for. How creative! I have this on my need to read list.